Now that a digital copy of the Library of Congress’s entire book collection could fit in a single shoebox, the future of the contemporary library is up for grabs. The New York Public Library’s proposed reconfiguration of its Manhattan headquarters is only the most recent high-visibility entrant in a debate that has been ongoing since the mid-1990s, manifested in the press and in a series of large urban central library projects in Berlin, Singapore, Seattle, and elsewhere. What should a contemporary library be? 1 Seattle is one oft-cited exemplar: there Rem Koolhaas and Joshua Prince-Ramus of the Office of Metropolitan Architecture jettisoned the reading rooms, study carrels, and hushed whispers of the traditional library in favor of a dramatic multi-story “living room” where patrons could, according to the architects, “eat, yell, or play chess.” But to find architects, librarians, and municipalities who have re-conceptualized the contemporary public library with a more nuanced and promising vision, we must turn our attentions away from noisy Seattle and other large projects toward the modest community library. Around the globe, a handful of innovative architects are forging a new building type with a deceptively familiar name. These libraries offer something found nowhere else in the contemporary city: heavily used, not-for-profit communal spaces that facilitate many and various kinds of informal social interactions and private uses. Ranging in size from five thousand square feet, a smallish McMansion in Westchester, to thirty thousand square feet, the size of Derek Jeter’s home near Tampa, some of these community libraries are neighborhood branches of an urban library system, and others stand alone. These buildings look nothing like one another, yet they all offer exemplary moments of architectural innovation. Collectively, they make the case that excellent design is no luxury, certainly not for the civic buildings and lives of people and their communities. Community libraries have been around for centuries. Andrew Carnegie did not invent them, but recognized in them the means to socialize the cost of knowledge, building nearly 1,700 public libraries across the United States in twenty-eight years. Across the country, local philanthropists built countless others, recognizing that the community library was often the only place to which people had sustained and repeated access simply by virtue of their residence. Even today, to become officially recognized as a borrower at your local library, no more than a recent electric bill is needed—no passport, no green card, no social security number, no purchase necessary. To use the library to sit and read and rest, you need only to want to sit and read and rest. Before the digital age, when local libraries were proud repositories for and symbols of humanity’s accumulated knowledge, the public goods that community libraries offered were books, and consequently their architectural arrangement was straightforward. Technically, they were typically loft-like spaces with strong floors. Functionally, they had a single point of entry (enabling staff to monitor the comings and goings of books and their users), stacks, reading tables, a prominently placed card catalog, and, ideally, natural light that fell on users and not on printed matter. Any number of architectural styles could convey the dignified solemnity befitting a civic icon. And so it went, generation after generation: libraries were built, and people knew that secreted within their walls a lifetime of glories awaited them in pictures and in words. What differentiates today’s community library from its precedents—what makes it a wholly new building type in form and conception, albeit one with a deceptively familiar name—is the variety of public goods that it contains, and the variety of ways those goods are used by people as individuals and collectives. People today rely on their community library for so very many things! Books share space with DVDs, CDs, magazines, Internet-connected computers, lecture halls, classrooms, and more. The unemployed, under-employed, and self-employed frequent them. Immigrants attend English-as-a-second-language classes there. Homeless people park there. Caretakers and their young charges read, or just escape social isolation without paying for that right at the local mall. Working parents use them as free, safe depositories for untended offspring. Retirees get to the classics they have long deferred, work on their long-dreamed-of memoirs, dig into their family genealogies. Bootstrap community organizations stage art shows, concerts, performances, lectures. Today’s community library looks and functions very little like its predecessor, having usurped functions once served by institutions such as YMCAs and Jewish Community Centers, absent the athletic facilities. The best of them, selling nothing, offer what no other contemporary building type provides: vibrant, informal, attractive, non-commercial community places where people of any age, class, gender, race, religion, or ethnicity can gather, and can obtain access to resources vital to full participation in contemporary life, including but not only the Internet. No wonder that, around the world, the construction of new small community libraries has spurred an impressive efflorescence of architectural innovation. People have wearied of bowling alone. Individuals need places where they can engage with others like and unlike them, with whom they share an affiliation just by virtue of inhabiting a particular city, town, or neighborhood. Groups of people need places that can help constitute them into and symbolically represent their community. Everyone needs what the urban sociologist Ray Oldenberg calls third places—the first is home, the second is school or workplace.2 That is what these new community libraries provide. The future of the library is up for grabs. This creates an engagingly complex architectural challenge, as the community library presents many competing mandates that are difficult to resolve in built form. To become a lively centrifugal social force that can buttress or, in more troubled areas, constitute a neighborhood’s sense of identity, it must project the impression that it is a civic icon and a public place. And yet it must also offer people opportunities to engage in solitary pursuits. Today’s community library might well be a place where one can eat and play chess, but it must not be a place to yell; it must still offer private moments in communal places, moments saturated in silence, light, the knowledge and the creativity of human expression. And all on a tight budget. How to distill such competing if not colliding imperatives—public, private; iconic, domestic; distinctive, local—into a coherent design? Even though technically all that a community library actually needs is enclosed, climate-controlled loft spaces, in fact it needs more. Only good design can make a mute, inert edifice convey to people that it embraces all comers and embodies their community’s shared identity. Many of the new library designs are loft-like spaces writ monumental, but they are much more than warehouses for computers, books, and people. Monumentalizing domesticity by design, they take their cues from the needs of people in general and community library patrons in particular: the neighborhood’s scale, the proportions of the human body, people’s innate receptivity to natural light, their tactile sensitivity and associative responsiveness to materials. Two projects on the west coast exemplify how just a few excellent design moves can transform even modest space into a civic magnet. 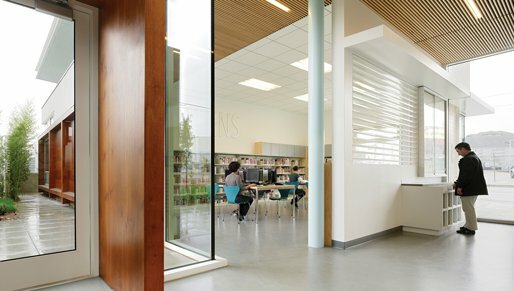 Anne Fougeron’s Ingleside Branch Public Library in San Francisco (5,000 sq. feet) and Peter Q. Bohlin’s Ballard Library and Neighborhood Service Center in Seattle (18,600 sq. feet) both create local landmarks from single-story sheds by topping out with distinctive roofs supported by columnar supports that create grandly scaled but inviting exterior porticoes. These roofs amplify the buildings’ scales, and establish repetitive rhythms that play counterpoint to irregularly composed indoor volumes. The Ballard Library’s roof dramatically sweeps upward at one end, its wood purlins visually continuing an outward, upward trajectory beyond the walls’ solid planes. This single gesture accomplishes much. It articulates the main components of the building’s basic structure, using them to make a memorable structure. It coaxes precious northern light inside. It imbues the building with a sense of movement and dynamism. The roof’s uneven curve visually and spatially differentiates the library, placed at one end, from the neighborhood service center at the other. And the exposed wood purlins symbolically refer to the lush, verdant roof they support, a sustainable tangle of weeds and grasses visible from various angles at the street level. When Louis Kahn, one of America’s greatest architects, designed a library for Phillips Exeter Academy in 1965, he set about the task by probing the institution itself. What should a library be? What is the essence of one’s experience there? He came up with a simple image of an answer: a library begins when “a man with a book goes to light.” Ingleside and Ballard both abide by Kahn’s dictum that the library’s central experiential conceit must always be the peaceful world we inhabit when we bring a book, or a Web page, to light. Fougeron and Bohlin use skylights, light wells, inset windows, and window-walls to draw abundant natural light into and through their projects, carefully managing it through reflection, filters, screens, and shades to avoid eye-straining glare. Ingleside and Ballard’s portico-shed solution has its shortcomings. Their exteriors are just a hair more than sufficiently iconic, and their interiors a hair more than generic. In less skilled hands, these buildings could easily have failed to become distinctive landmarks. An alternative approach is evident in MVRDV’s striking glass barn of a Book Mountain in Rotterdam and MADA s.p.a.m.’s wave-like, ribbony Community Center and Library in Qingpu, China, also known as Thumb Island. Book Mountain and Thumb Island are both commanding civic icons, but their architects have stretched so far to produce a distinctive form that parts of their buildings suffer from an opposite problem: their interiors pale in comparison with, and perhaps were not helped by the aesthetic imperatives of, their striking exterior conceits. MVRDV’s 110,000-square-foot vitreous Book Mountain, plunked astride a major traffic thoroughfare in an underprivileged neighborhood, relies upon its transparent, non-reflective skin to advertise and shelter a monumental shelf-lined ramp that spirals into a pyramidal ziggurat and climaxes in a summit of panoramic views. The spatial procession, metaphorically appropriate to a library, is of ascent toward illuminating light. Qingpu’s library, sports club, restaurant, and theater complex is a lilting, grass-covered building of unevenly sloped, abutting hillocks set in a newly made artificial lake. Multi-story loft spaces and outdoor terraces fold into one another in a rolling inside-outside landscape of changing perspectives, while the sloping green roofs absorb runoff, insulate the interiors, and create an urban garden that the architect envisioned as a place for morning Tai-Chi. Book Mountain and Thumb Island are iconic, to be sure, but their interiors fall short of creating the full range of interior experiences imperative for today’s community library, certainly of those in Ingleside and Ballard. To create Book Mountain’s conference rooms, offices, study carrels, reading tables, and exhibition terraces, MVRDV weaves in gullies and plateaus, but this hardly solves the architects’ self-created problem of making a library into one large covered room: one yearns for places to escape, acoustically, visually, spatially. Thumb Island, like many adventurous (and not so adventurous) Chinese buildings, is more image than place. With gross inattention to materials and construction details, it looks, six years after completion, as though it will soon be begging for renovation. These four buildings, all impressive, fulfill many of the community library’s competing imperatives. But they are less effective in grappling with two dimensions that are important in any contemporary building and critical in a civic icon: environmental context and cultural context. Since the community library should ideally nurture users’ sense of it as the anchor and symbol of their commonality, it must suit locational and cultural particularities and still stand out from its surroundings. That is a tough nut to crack—especially as most new community libraries sit in aesthetically inconsequential neighborhoods. Across the street from Ingleside is a Chinese bakery and an auto body shop; across from Ballard, a drugstore and an office building. Book Mountain abuts a highway, and surrounding Thumb Island’s lake is a boring run of mid-rise residential blocks. How, in such surroundings, to do the other things the community library must do and to make a landmark at once indigenous and distinctive? The brightest stars in the community library firmament show the way. These are the two new buildings in Washington by David Adjaye, and the Library and Culture Center in tiny (population twelve thousand) Vennesla by Helen & Hard. Adjaye, more perhaps than any other star-studded contemporary architect, recognizes the social importance of the community library, and has vigorously tackled the project of re-conceptualizing and building them.3 When the head librarian of Washington’s public library system4 asked Adjaye, who had just won the commission for the Smithsonian’s new Museum of African American History and Culture (to be completed in 2015), whether he would consider designing two small libraries as part of her overhaul of the city’s many neighborhood branches, Adjaye didn’t hesitate. Already having built two influential community libraries in the impoverished Tower Hamlets section of London, called “Idea Stores,” he replied that he was “super interested.” This commission was not small. Adjaye’s Francis A. Gregory Neighborhood Library and William O. Lockridge Bellevue Neighborhood Library, and Helen & Hard’s Vennesla Library and Cultural Center, all under twenty-five thousand square feet, deal skillfully with the issues variously raised and partly resolved in the libraries in Seattle, San Francisco, Rotterdam, and Qingpu. They balance civic presence, visual dynamism, and genial interiors. They draw in natural light and orchestrate it to prevent strained eyes, damaged books, and overheated computers. Noisy spaces are separated from quiet (or at least quieter) ones. With sometimes amusing, sometimes merely impressive compositions of materials and carefully executed details, they respectfully convey a sense of dignity to their citizen-users. Adjaye and Helen & Hard also interpret subtly their sites’ urban and cultural contexts without retrograde historicism or unthinking populism: they make of this humble municipal building an arena for social interaction, a refuge for splendid isolation, a distinctive civic icon that helps users build a sense of common identity. The Francis Gregory, Bellevue, and Vennesla sites range from the merely ordinary to the eye-smartingly banal. The two D.C. sites are differently unprepossessing. Adjaye is so attuned to the nuances of urban context that one might be hard pressed to identify them as the work of one designer. Francis Gregory is steel and glass, Bellevue is concrete and wood. Francis Gregory presents a single monolithic volume, Bellevue an irregular accretion of concrete pavilions. Context drives the aesthetic. Francis Gregory edges an unkempt, overgrown public park across the way from a pedestrian array of small neo-Georgian houses. Down the street an Exxon station faces a strip of formaldehyde-reeking storefronts—a manicure shop, a dry cleaner, a hair salon. The neighborhood’s only distinctive feature, Adjaye decided, was the park, so he developed his concept from that element, designing a glass box woven from a triangulated steel frame with an irregular structure that echoes the park’s happenstance foliage and scrub growth. Even the main lobby’s double-height ceiling is glass-clad, offering skyward views. This is a building one must see in person to understand, as photographs exaggerate its anomalous monumentality. Go, and you will come upon a low-slung, block-like beacon where clear, glass, wood-mullioned diamonds alternate with opaque, mirrored ones that reflect the surrounding landscape’s greens and blues. At night the beacon shines a bright light through the neighborhood. The steeply sloping site of the Bellevue Library did not even offer the inspiration of a park: the nearby main drag is all auto body shops and check-cashing stores. Immediately adjacent is a concatenation of low-slung commercial buildings and modest brick and wooden houses, some with stilted lean-tos slouching into their rear ends. What to use? Adjaye trained his eye on those lean-tos. They were unusual. Their elevated post and lintel structure became the design conceit; evenly spaced vertical wooden slats and differently sized elevated pavilions create sheltered outdoor areas for residents to congregate. Of the interiors of Adjaye’s two libraries, Bellevue’s is spatially more complex, drawing users up a lemon yellow staircase and a long, lazy ramp leading from the lobby, to the second-floor children’s area, teen rooms, and classrooms, and finally to the quiet, well-proportioned reading room and stacks on the third floor. In both projects, mostly inexpensive materials are deployed with rigor and finesse. Francis Gregory’s elongated glass diamonds are thickened inside with stained wooden planks that warm incoming light and offer places for users to nestle in. Helen & Hard’s Vennesla project reveals that they, like Adjaye, are more than equal to the many competing social and aesthetic challenges posed by today’s community library, and that they, like Adjaye, possess the vision and the talent to make of this small and unpromising building type a lively, inviting, and eloquent civic place. 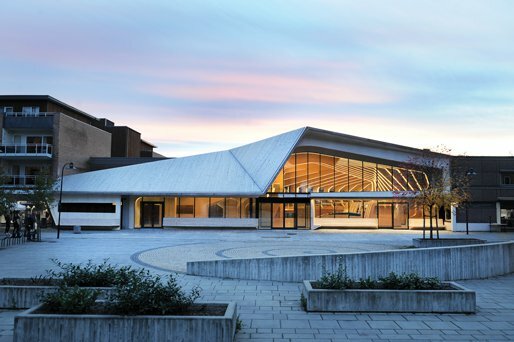 When their Vennesla Library opened last year, The Huffington Post published a slideshow of photographs with the headline, “the most beautiful library in the world?” That’s overstating it—at least as long as Henri Labrouste’s Bibliothèque Nationale in Paris and Louis Kahn’s Exeter Library still stand—but this community library is a stunner. For Helen & Hard, context and site are key. Located on a pedestrian-heavy street near Vennesla’s town center, the library stretches between an existing cinema and a small office block. You are drawn in by a modest, sleek portico from which, through a large window-wall, you catch changing glimpses of the light-filled, double-height, ebulliently wooden rib-vaulted space within. Norway has a nearly unbroken tradition of architectural innovation in wood, from its fascinating medieval stave churches to its many woody interpretations of Scandinavian modernism. The largest nearby city, Stavanger (where Helen & Hard maintain an office), celebrates its unusually large stock of well-preserved eighteenth-century wooden houses. Entering the Vennesla library’s vaulted interior, you feel pleasingly enveloped, as if you were standing in a small light-drenched nave, or perhaps beneath the inverted shell of one of Norway’s many large wooden boats. The ceiling’s ribs progressively lengthen in span as the spacing between them contracts, establishing a quickening rhythm to your spatial procession that crescendos as the room cranks forty-five degrees to the south, a moment also marked by a change in floor level. These wooden ribs serve many functions: structurally, they support the roof and act as columnar supports for the walls; practically and aesthetically, they hide and house wiring, HVAC, acoustic insulation, and light fixtures. The greatest surprise comes as the ribs curve in toward the floor, where they become all manner of useful things: shelves, reading nooks for adults, low-rise desks for kids, benches, carrels. Here is all a contemporary community library should be. Vennesla’s visually arresting pattern of repeating wooden ribs, their uncommon rhythmic arrangement and multiple functions, monumentalize this small building and make it memorably, freshly imagistic. The building gracefully acknowledges its urban and cultural context by picking up on the neighborhood’s modest scale as it urges you into its woody, light-drenched atmosphere, invitingly domestic, full of variety, and thoroughly Norwegian.5 In the Vennesla Library’s public living room you can be among members of your community, people similar to and different from you, and you can be alone. These architects and buildings create a distinctive social experience that only a community library can offer. They insist upon the importance of both meaningful social interaction and silence in a cacophonous world. They nudge local residents toward a resonant sense of communal identity. They look less to the past than to the present and future. The best ones insist upon the social importance of innovative, forward-looking, challenging design, and the best of the best demonstrate the importance of contextual specificity. These are landmarks, bookmarks, and people-marks. Each, in its small quiet way, actively contributes to the vitality of the public realm. For a book-length treatment of the changing function of libraries, see T.D. Webb, ed., Building Libraries for the 21st Century: The Shape of Information. Ray Oldenberg coined the term “third place” in The Great Good Place: Cafes, Coffee Shops, Bookstores, Hair Salons and Other Hangouts at the Heart of the Community. On Youtube, there are two excellent videos on Adjaye, his work and his approach to public architecture: "Adjaye Associates, Ideas Store, London" and "David Adjaye." Ginnie Cooper heads the DC Public Library system, and won the American Institute of Architects’ 2013 Thomas Jefferson Medal for Public Architecture for commissioning branch libraries by Adjaye Associates, Davis Brody Bond Aedes, CORE, Bell Architects, and the Freelon Group, among others. See the next exhibition on Nordic architecture in D.C..